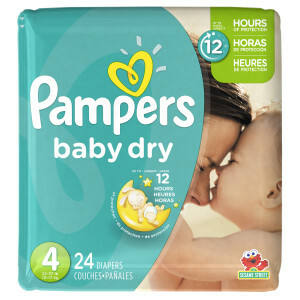 Pampers Baby Dry diapers offer little ones up to 12 hours of overnight protection! A dry night means baby will more likely be more rested, less fussy and more contented the next day. We all have had the restless nights of waking to change a diaper. Those are not fun…nor is waking up to a wet bed. – An “Ultra Absorb” core to cover up to 95% of overnight loads. – Our most absorbent Baby Dry ever (sizes 2-5) with a 15% increase in capacity. – Three layers of absorbency vs. two (the amount found in ordinary diapers). – A longer absorbent area and new, fun graphics. – Snug, stretchy sides, colored tabs and a belted design to reassure parents that the diaper will hold up. Pampers is having a fun Twitter Party to chat about how the end of Daylight Savings Time can affect sleep patterns & get more tips on easing the transition from The Sleep Lady, Kim West. The Twitter Party will take place on November 7th at 9pm EST. RSVP Here to join the conversation and be eligible to win prizes! To participate, follow your hosts @DoubleDutyDivas, @BridgetteLA, @CeceliaMecca @AngieKcom @WhatMommiesNeed @RamblingChick, sleep expert @TheSleepLady and our sponsor @Pampers. Make sure to connect with Pampers on Facebook also! Now on to our Giveaway! One lucky winner will receive a pack of Pampers Baby Dry Diapers and a pair of Children’s Place PJ’s. Ends Nov. 7, 2013 at 11:59pm est. Open to US Only. There is a baby due in my boyfriends family. The new baby will be enjoying the diapers and PJs. It would be for my little one due Christmas! A friend of mine who is having a baby in January!! I would love to win this prize for my cousin who is due in January. My nephew they just had a baby boy last month. My friend would appreciate them since she is due later this month. My sister in law just announced they are expecting their first – so for her! I son would definitely love this! I hope I win it! My friend is expecting so obviously the diapers would go towards her shower gift! My nephew would love both! my niece would love them for her soon to be born son…. Both my daughter and daughter-in-law. They both have 1 year olds and another on the way!! My daughter would love this. She’s having a baby in 2 months. A good friend of mine is expecting this month! This would be perfect for her! My son would love this. But his father and I would really love this. This would be for our new one due in Dec. I would love to win this for my baby boy! My Nephew In Law is expecting his first child on Dec.25! my girlfriend would like these for her twins girls. My neighbors just had twins, I am sure they could use these. Our son would love these! I would love to have these for my son, even though he isn’t a fan of diapers or clothes. My daughter would love the diapers and my son would love the PJ’s! My 2 yr. old grandson would really like this great prize! Thank you! They would be for my daughter. We just found out she is going to give us another grand baby. These would be a gift for a friends daughter. we have a new baby due soon! I would give the diapers to one of my pregnant friends, and the pjs would be for my daughter. Thanks for the great giveaways! My grandson would love new PJ’s and the diapers will help keep him dry. These would be great for my granddaughter. My grandson would enjoy this prize. My new grandson would love these new diapers and pjs. I would love to win them for him. Co-worker who’s daughter is due any day! I will have to decide between my great niece or my great nephew… maybe split it? Lol! They would be for my cousin and her son. My baby boy!!! weston!! or soon to be baby! I would love these as I have 2 kids under age 2. My daughter would lov ethem! My sister would love these. That’s who I’d give them to if I won. Me! My daughter goes through diapers like water and being a single mom, any bit helps! And as for jammies, she doesn’t have any because she outgrew what I had and she has just been wearing onesies to bed. My cousin’s baby boy who was born a couple of weeks ago! My granddaughter would love a new pair of PJ’s! My sister would love the diapers and my dd would love the PJs! I would like to win this for a coworker who just had a baby. My cousin is due in January and these Pampers would definitely be appreciated by her. My best friend just had a baby girl, so my god daughter would love these!!! I would love to win the diapers and pjs for my son! !